Shift it into high gear for the most exciting racing challenge ever to fit in the palm of your hand. Based on the arcade classic of the very same name, RACE DRIVIN' is a faithful rendition of its predecessor, with graphics and sound that emulate the sit-down version that you might remember from the back room at your local pizza joint. Choose your own car then hit the tracks, trying to bypass the competition and land squarely in first place. There are three different tracks in all, each with its own characteristics and unique obstacles. Each of the game's cars also boasts individual advantages and disadvantages, so make sure to pick the one that best suits your style of play. 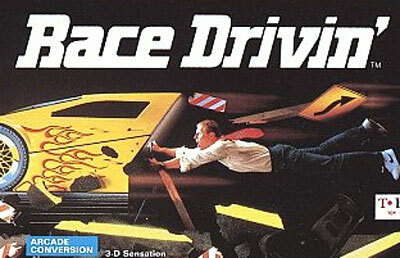 RACE DRIVIN' offers some of the edgiest action ever to come to Super Nintendo!